OK – to get the first question out of the way, you’re probably thinking: What does “Stykera” mean anyway? Long story short: it’s the brain-child of the Editor-In-Chief, Mr. Alan Bigley and is an obscure reference to a know-it-all, forward thinking race of beings in the even more obscure Sci-fi show called “Farscape”. In the show, the Sykera were intelligent drone-like beings created by a vastly superior race to propagate and take over the UNIVERSE! Deep man. Similarly, the flying drones of today represents human’s first mass-produced step in propagating and carrying on our legacy into the universe! Next question: What is this site all about? Now that’s a bit easier to answer. 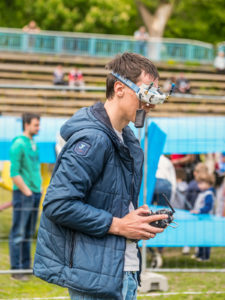 Stykera.com is all about helping drone enthusiasts and pilots understand the vast amount of information related to buying, building, flying, and racing quadcopters and other rotor-type drones. Since most of the folks we deal with are not super technical, we’ll concentrate more on the Ready to Fly (RTF) and Almost Ready To Fly (ARTF) UAVs, leaving the more technical building aspects to other site who know what their talking about. Although not the primary purpose for the site, we may use affiliate links from time to time to pay for the upkeep of the site. In these cases, we’ll always be upfront and honest on the intentions of the post, review or article. Thanks for flying with us today!